This was taken place before the New Year’s, December 29th. Yeah, I’m behind. It’s been a year hiatus since I’ve been to Jean Georges and I thought it’s about time to eat there again before New Year’s dawns upon us. Perusing through the menu, it didn’t change much with the exception of tweaking some ingredients or flavorings to make it more “seasonal” or adding in some new dishes like Nishiki risotto, Parmesan, yuzu, Thai chili and Japanese red snapper carpaccio, crystallized ginger, white radish and olive oil. Eventually, I chose to go with the two-course, two-dessert route. 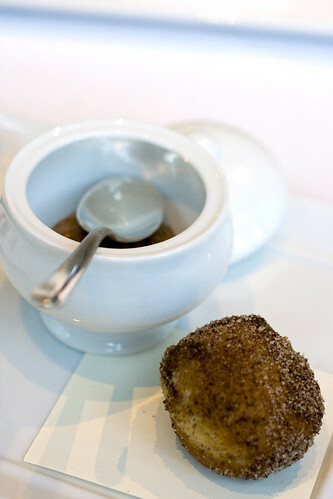 As always, in Jean Georges at least, the amuse bouche was given. 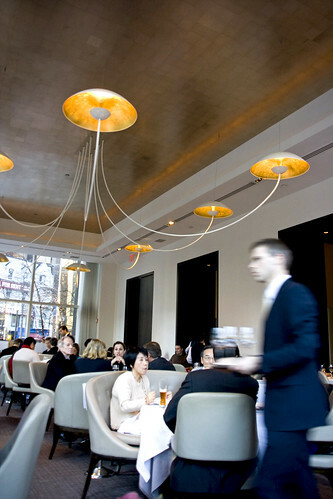 It’s similar to what I had [cref lunch-with-two-exec-chefs-at-jean-georges last time]. The difference between then and now is, swapping out the shiitake mushroom for a dehydrated tangerine with a citrus-flavored gelee. This particular part of the amuse wasn’t appealing to me. It was very dry (flavor-speaking) and a bit too tart (that I coughed out loud to this moderately quiet dining room) and it’s one-note flavor: citrus. 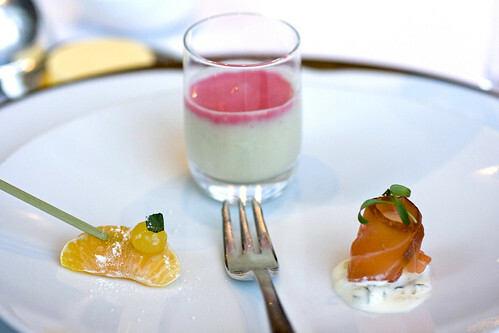 The other amuses were a shot of artichoke soup with hibiscus foam and a slice of salmon belly with scallion sauce. Of the two, I liked the soup more. It’s earthy yet the foam lightened the rich texture and added some floral notes. Moving on to the first course, I had roasted brussels sprouts, avocados and pistachios, mustard vinaigrette. 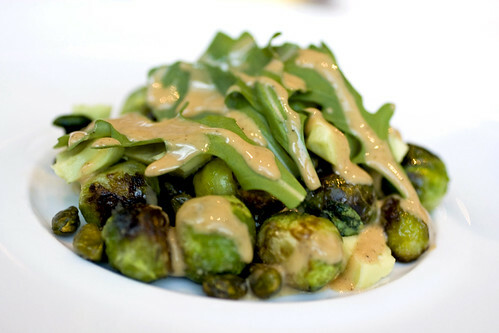 I love the roasted brussels sprouts because of the sweetness that comes out when it’s caramelized and the bitter undertones that is usually associated with this vegetable. The pistachios added a kind of creamy, nutty element as well as the avocado slices, found underneath the pungent arugula leaves. It was good, not exactly earth shattering though. Two desserts! Yes, I was crazy (arguably bold) enough to think that I could finish two desserts on my own. 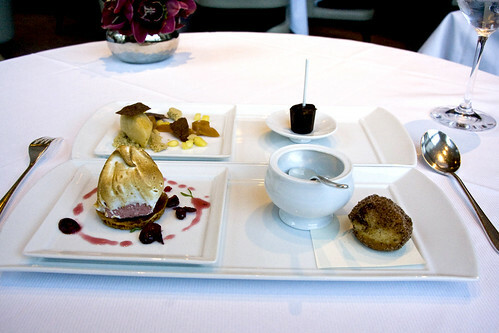 Starting with the seasonal dessert theme, Winter, a plating of cranberry parfait, walnut nougatine, soft meringue and a cinnamon doughnut and prune-Armagnac jam, they were both very good. 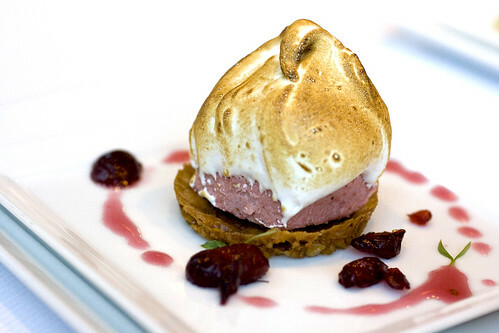 I liked the texture of the cranberry parfait – cold, smooth and creamy from the parfait and the slightly warm, marshmallow-like pillow of meringue contrasting a whisper of crunchiness from the walnut nougatine base – but I would prefer the cranberry flavor to be more robust. The cinnamon doughnut combination with the jam was delicious (light and airy, not greasy doughnut meets creamy, sweet with a touch of alcohol jam) but I wanted a bigger doughnut to schmear on the rest of the jam. 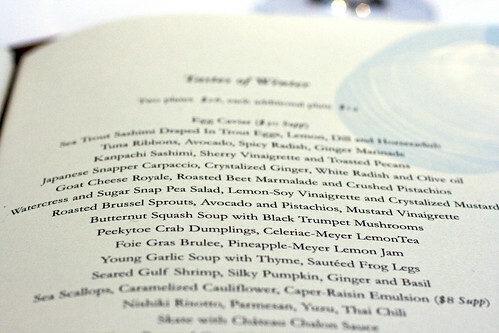 The menu should have mentioned doughnut hole, even though I know I was expecting it to be on the tasting portion side. Hey, I like doughnuts! Don’t deprive me of wanting more if it’s good. Moving onto the other dessert theme, Caramel, this was generally disappointing. 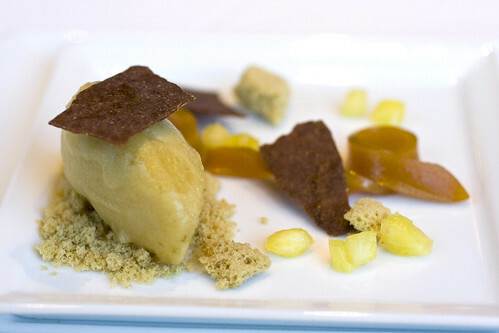 The portion of caramel curd, dehydrated sponge, roasted pineapple sorbet flavors and textures were discordant. You have the cold, sharp, sweet pineapple sorbet with the almost-chewy caramel curd that doesn’t taste caramel-ly enough and the dehydrated sponge just added a crunchy texture, not much in terms of flavor. It’s weird and left me scratching my head wondering if I missed something. 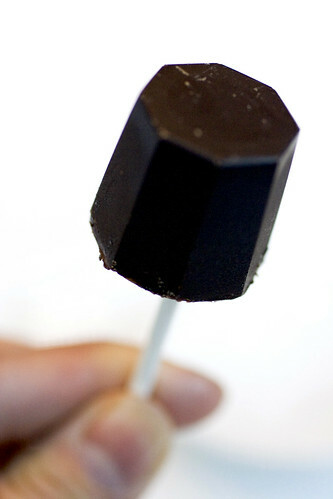 The saving grace of this tasting was the chocolate pop, coffee-cardamom ice cream. 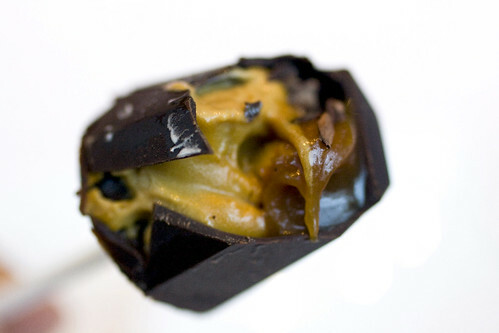 Smooth, creamy ice cream that’s boldly flavored with coffee with a hint of warm, sweet-spicy flavor of the cardamom encapsulated by crisp tempered dark chocolate. This was awesome. 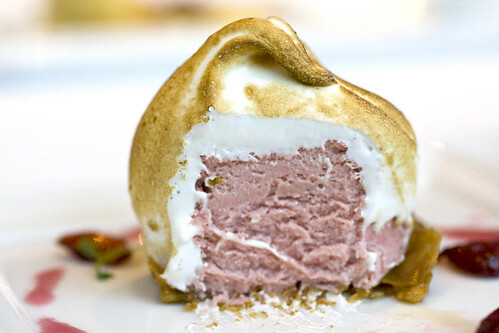 I wouldn’t have mind if Pastry Chef Johnny Iuzzini just serve me a normal sized ice cream bar of this. And as every Jean Georges lunch (I don’t know about dinner since I can’t afford it yet) ends, mignardes was served. 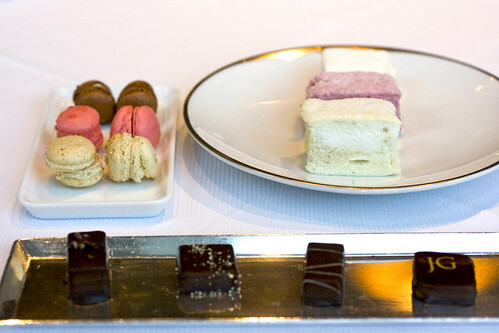 Nothing changed here – the usual puffy macarons (that aren’t remotely divine as Pierre Herme), bonbons to nibble on, and the trio of house-made marshmallows. Nothing much to note about but it’s a nice way to end the meal and a bittersweet ending to 2008. Yeah, something about “dehydrated sponge” does not seem like a dessert to be optimistic about! Even though some of the dishes you had weren’t amazing, I’m still envious of your meal. Especially the soup amuse bouche, though I don’t really know what hibiscus tastes like. An amazing gourmet experience. Lucky you! Great shots! 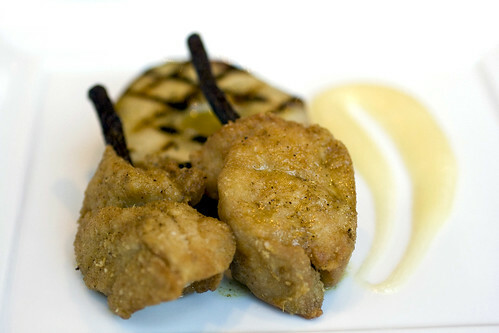 Haven’t made my way over to Jean Georges, saving it for a special occasion, but it all looks delicious. First time I’m commenting surprisingly, but hope to keep in touch! Marie: Well, the lunch is relatively inexpensive for what you would get from a high-end restaurant: 2 savory courses for $28, $13 for an additional; $8 for dessert. Always Eating: Thank you and thanks for delurking! You should try them out for lunch. It’s waaay cheaper than dinner. Let’s just say that they ran out of salt in the kitchen, because they decided to dump all of what they had on MY plate. Blech! The photos are amazing. I’m not a big fan of JG in terms of price vs. quality, but got to respect the service and presentation. Dollar for dollar best lunch in Manhattan, you should try to go more often. I have been most weeks over the past 10 years. VeggieGirl: Ah, I see. Sorry that you had to face that situation. catherine: Even though JG is pricey for the not-so-wealthy (e.g. a poor college/graduate student), this particular lunch venture is worth it in terms of the superb quality of the ingredients. Randy: I went there pretty often back in 2008 but I don’t feel compelled to go there once a week since they don’t change their menu often.